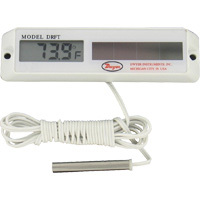 Digital thermometer indicators for temperature. Solar-powered, some models have an adjustable stem while others have an LCD display. 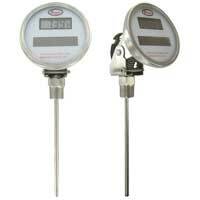 There are remote probes that are compact and thermometers that can switch from Fahrenheit to Celsius. 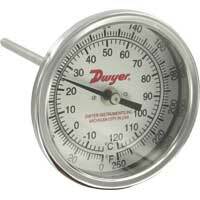 Spirit-filled thermometers are indicators for temperature. 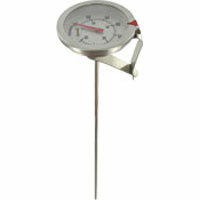 Thermometers have different scales and stem lengths with high accuracy and ruggedly built models. 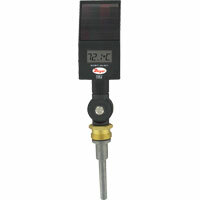 Allows user to easily take temperature measurements. 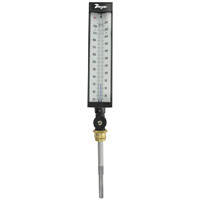 A few models reduce installation cost by eliminating need to drain system when servicing industrial thermometers.